Every once in a while, I generate a...hmmm, "Non-standard" Fly Baby picture. Or someone speculates on what a slight or major modification might look like, and I oblige with a bit of Photoshop magic or a new drawing. I got asked if I could publish a set of links for my altered pictures. Instead, I just crammed them all into a single web page. By the way, UNaltered fun pictures can now be found on the Slight Weird Pictures Page. Back in the '60s, Pete Bowers did a little thinking about the Fly Baby model 1C. 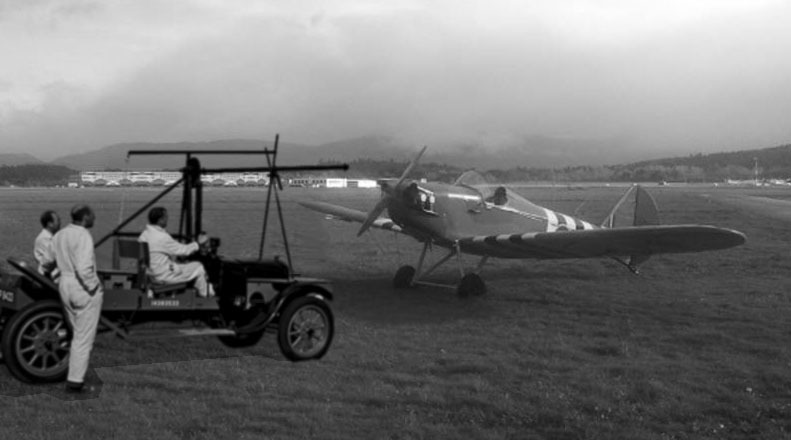 The 1A is the monoplane, the 1B is the biplane, and the 1C would have been a parasol-winged airplane, kind of like a Baby Ace or Pietenpol. This didn't get much beyond the speculation stage. My guess is that too much stuff had to be re-done. 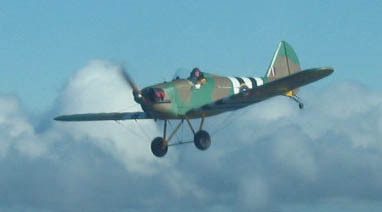 To allow access to the cockpit, the plane would have needed a wing center section set forward of the cockpit (like the biplane) and the wings swept back to maintain the CG. But that would mean you couldn't use the stock wings...the ribs would be crosswise to the airflow. 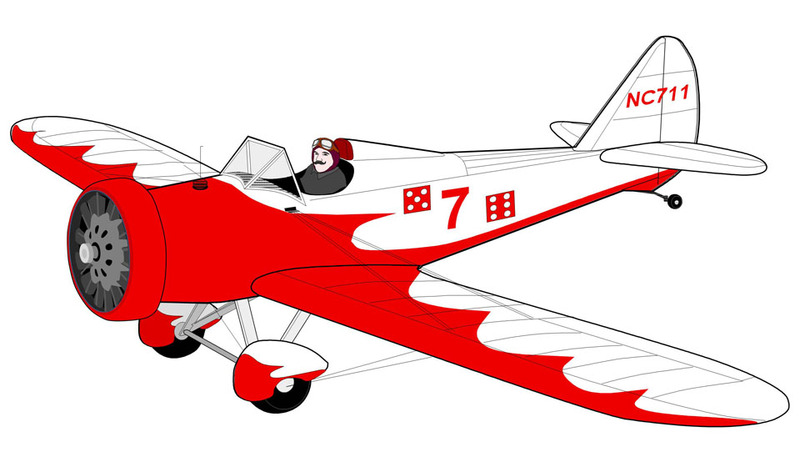 The 1C would have needed brand-new wings, just like the biplane. Pete probably figured it wasn't worth the bother. All right, I admit it: I was feeling especially goofy that night. I had a copy of a photo of a supersonic F-14, and decided that a Fly Baby really deserved to be in the middle of that condensation cloud. I can't help it: I'm a sucker for military paint jobs on Fly Babies. I've always loved the WWII British camouflage scheme, and figured I'd give it a try on a Fly Baby. I dubbed the design the "Hurribaby"...just to forestall those who might call it the "Spit-Up". 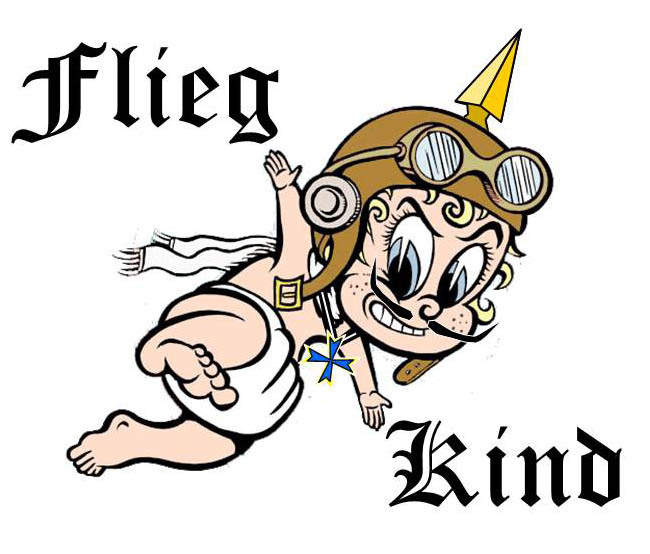 Interestingly, Drew Fidoe painted his Fly Baby this way. 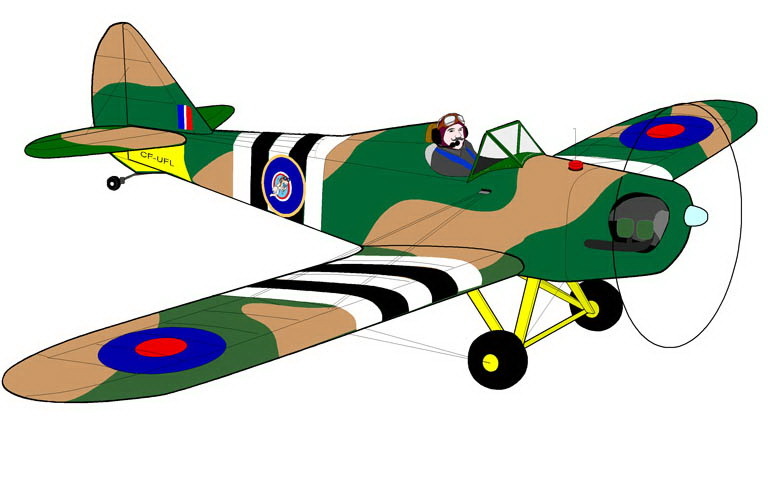 He painted the belly yellow...that was standard British practice for training airplane...and added D-Day invasion stripes. 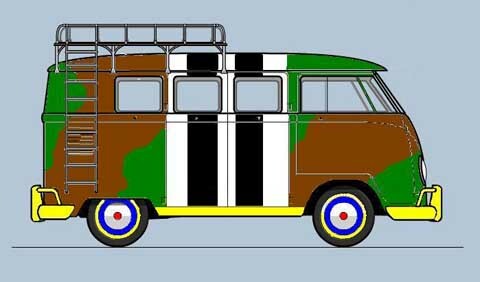 He duplicated the paint job of the Miles Messenger that Field Marshal Montgomery used. . I really do get a kick out of military paint jobs on Fly Babies, especially those where the 'Baby masquerades as a non-US military aircraft. I like the Day/Gauld-Galliers Junkers, I like Bob Grimstead's "Bristol Balderdash." I've been mulling over the potentials, lately. I like the "Hurribaby" scheme, but, in all honesty, I don't really think flying in busy airspace with camouflage paint is all that good of an idea. Which leaves us, really with the 'tween-wars period, so ably captured by Bob's airplane. So: What could I shoot for? First, I'd like to try to mimic a real aircraft. It doesn't have to look that close, but I preferred something historical to point at. 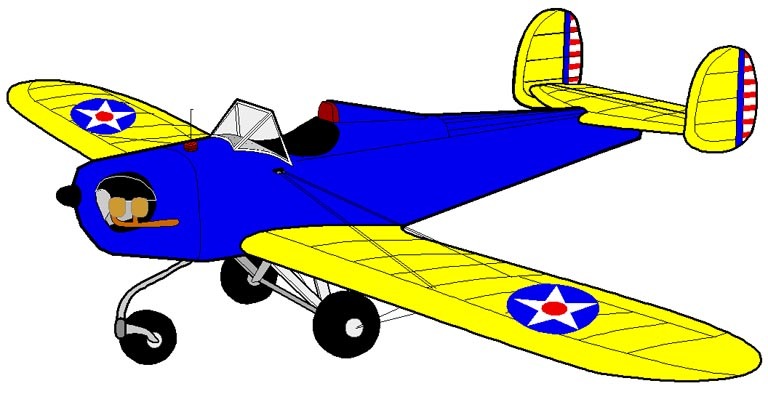 The pre-war US Navy paint schemes were pretty nice, with yellow wings, gray fuselages, and lavish sections of colored paint to denote the squadrons the planes were assigned to. I had been thinking of a mythical Curtiss F9C-3 monoplane prototype, when my mind flashed me with a vision of another nation that used gray and large splashes of paint on very pretty aircraft: Japan. It really flooded in, then. 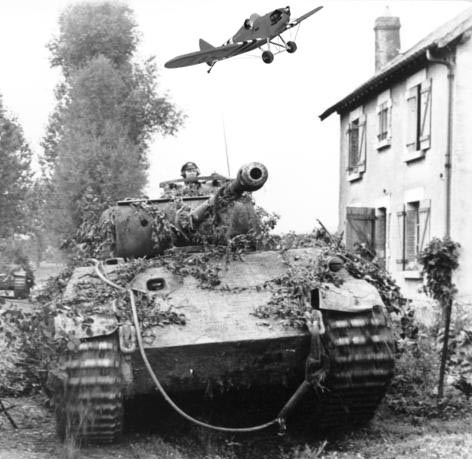 I remembered that the Flying Tigers' first fighter adversary wasn't the Zero, but a *fixed wing open-cockpit* fighter. Yow. 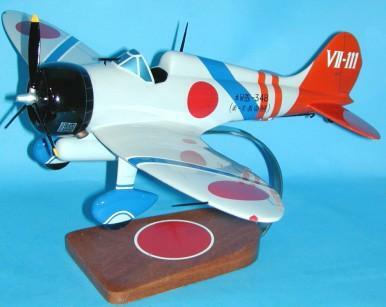 A bit of web-digging, and I found it: The Mitsubishi A5M "Claude," the immediate predecessor to the immortal Zero. The neat thing was, it was *very* close in configuration to the Fly Baby (except for the radial engine, of course). This drawing has only three cosmetic changes from the standard airframe: Filled-in gear Vs to go with the wheel pants (to simulate the big spats of the Claude) and a extended turtledeck. The subject of tricycle-gear Fly Babies came up on the mailing list, and we had a bit of a discussion on the topic. I ended up doing two drawings showing different approaches. Here's one of them. By gum, now I've gone too far! Cantilever wings came up on the mailing list. I personally *like* the wires, but some people think a cleaner wing would be better. I did this drawing to illustrate what a Fly Baby without wing wires might look like. By the way, here's the original picture. Hey, this picture's not even fake. It's a photograph of an actual instrument I have in my airplane. Building something like this is pretty simple. Just pick up an old non-functioning gauge at a Fly Market or garage sale. Take it carefully apart...the "face" portion of the gauge should be held in place with just a couple of tiny screws. Measure the face area, then draw up something on your computer using just about any simple drawing package. Print it on your ink jet using photo-quality paper, spray both sides with clear preservative, then glue it onto the face plate. Reassemble the gauge, leaving out anything that's not visible (I even ran my gauge through my band saw to eliminate the back half of the shell). I'm a strong supporter of Young Eagles, and my one regret is that my Fly Baby can't carry any. One summer, though, I noticed that there were occasionally some sad kids who were too young to fly with YE. I usually offered to at least let the kid sit in the cockpit of my airplane. I came up with "Cockpit Club" cards as a memento for these fledglings. I used my inkjet printer and business card stock. On one side was the logo, and on the other side was information about my airplane...performance, size. etc. I'll admit it...I got the idea for this one from the RV crowd...in fact, Renate Reeve's Fly Baby is sitting atop where an RV-4 was, before. But since she lives in South Africa, how else is she going to get to Oshkosh? An ordinary Fly Baby picture, showing a dashing aviator by his steed? I think not. Here's one you can't blame me for. George Trepus, a friend of Pete's from way back when, sent me this drawing of an inverted-gull-wing Fly Baby. Says George, "Pete and I talked about the possibility of such a variation lots of years ago. Maybe cantilevered or possibly a center section with wire-bracing, or both. I got busy raising a family." Pete never dropped the idea of the bent-wing, as his two-seat Namu had the feature. OK, back to birds you can blame me for. A discussion came up on the EAA's Oshkosh 365 forum page, asking about twin-tailed homebuilt aircraft. Naturally (or as most people on the Fly Baby mailing list said when they saw it, "UN-naturally"), I had to come up with a twin-tailed Fly Baby. Could it be done? Probably, but it wouldn't be quite as simple as you might think. 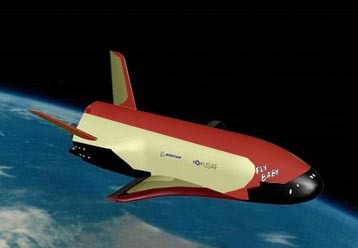 The stock Fly Baby tail is wire-braced, and this would not be possible on a twin-tailed design (the Vertical stabilizers to horizontal stab could be wire-braced, but not the horizontal stabilizer to the fuselage). You'd have to redesign the horizontal stab into a cantilever design. Just for heck, I tried a trigear version, too.... Looks a lot like an Ercoupe, in this manifestation. There's a dam near where I live where they discovered some unexpected deterioration. The announcement was made that if the Seattle area got heavy rains (and, hey, it IS Seattle...) they would have to open the sluice gates and let a bunch of water downstream. This would could cause up to four feet of water in a highly-industrialized valley south of Seattle. Even before my knee started getting bad, it was kind of a pain to lift myself out of the cockpit. 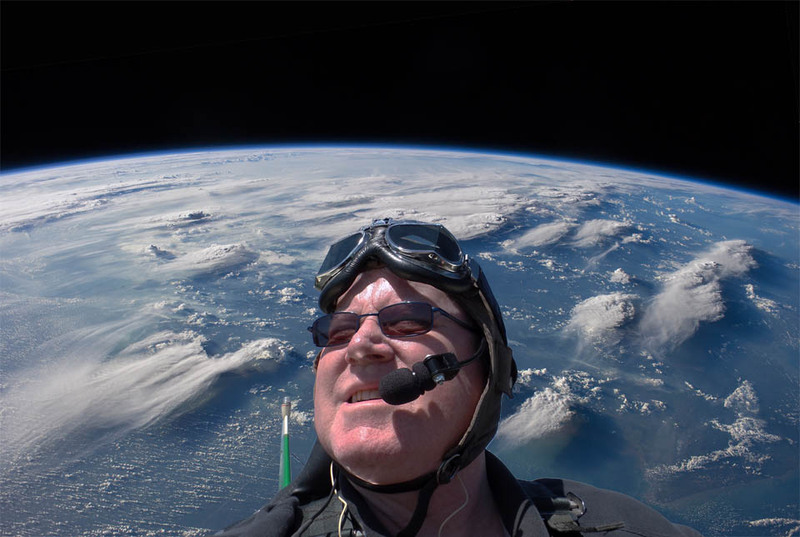 Years ago, I contemplated building a set of biplane wings, just so I could have something above me to hang onto and hoist me out of the cockpit. But I loved the monoplane configuration. Install just the center section? Naw, it'd look TOO weird. What I needed was an excuse to mount some sort of structure above the cockpit. But what kind of plane had that? Then it hit me: The Curtiss F9C-2 Sparrowhawk. The F9C was a small biplane designed to operate from the US Navy's two dirigible aircraft carriers, the Akron and the Macon. The top wing was attached directly to the top of the fuselage, and a big hook was installed above the cockpit. A long rail extended forward from the hook. The dirigible would drop a trapeze below its hangar, and the Curtiss would come up underneath and hook on. The fighter would then stop its engine, and the dirigible would pull the plane up into its internal fighter bay. (There's a cable channel that runs the old movie "Dirigible", with great footage of this process). 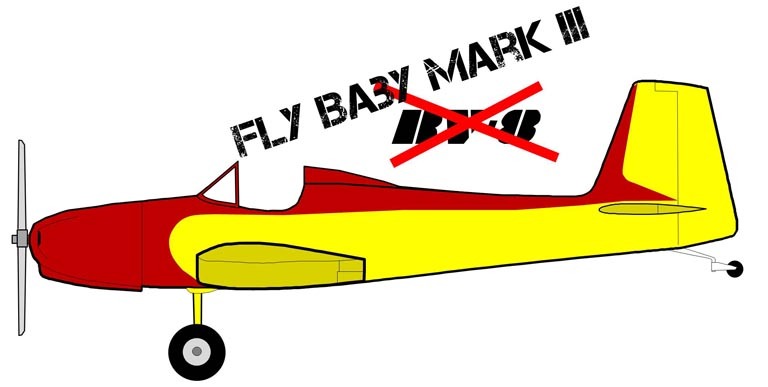 But the Fly Baby is a monoplane, not a biplane like the F9C-2? Well, simple: The Fly Baby can become the un-built follow-on to the biplane Sparrowhawk: The Curtiss F9C-3! Drew Fidoe made baaaaad mistake a couple of years back. 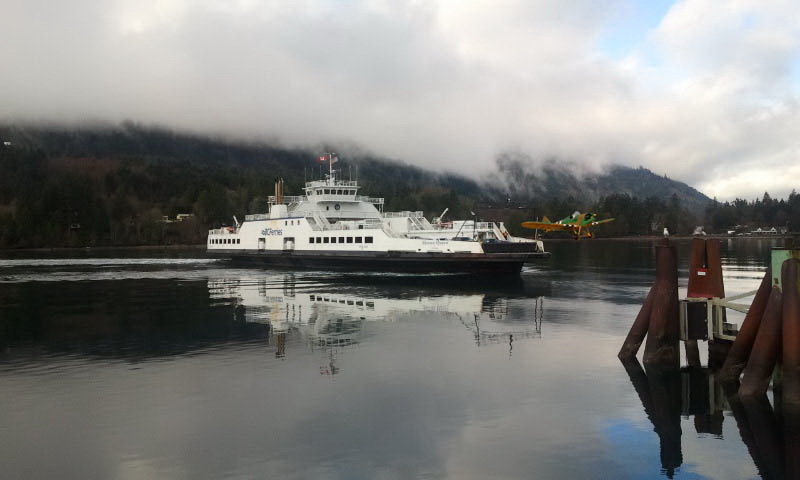 He sent me a very good picture of his recently-restored Fly Baby. The picture was of the whole airplane, at an attractive angle, well-lit. What's bad about that, you ask? Well...it just lends itself TOO well to Photoshopping. 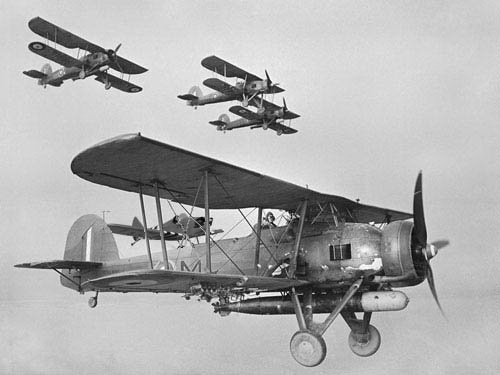 Couple that with the airplane's WWII paint job, it's nickname "Stringbag" after the famed British Fairey Swordfish torpedo plane, Drew's status as a retired Canadian Navy Petty Officer, and his current job...well, the temptation was too much. 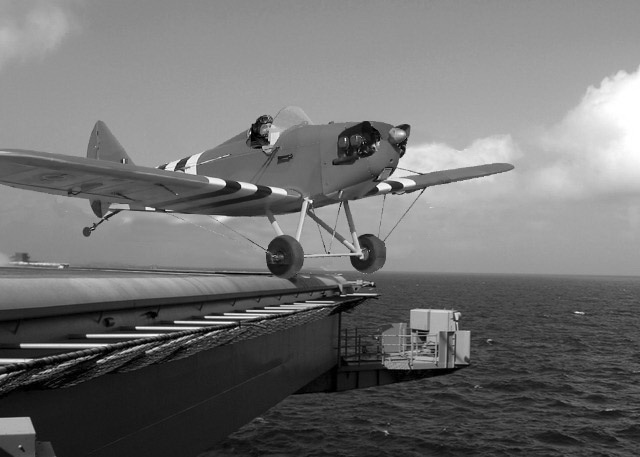 Of COURSE, Stringbag had to be showing taking off from a carrier, on the way to attack Taranto! The bravest pilots of WWII were those flying the Catapult Aircraft Merchantmen fighters. Catapults were installed on ordinary merchant ships that would let them fling a fighter aloft to defend against attacking German bombers. 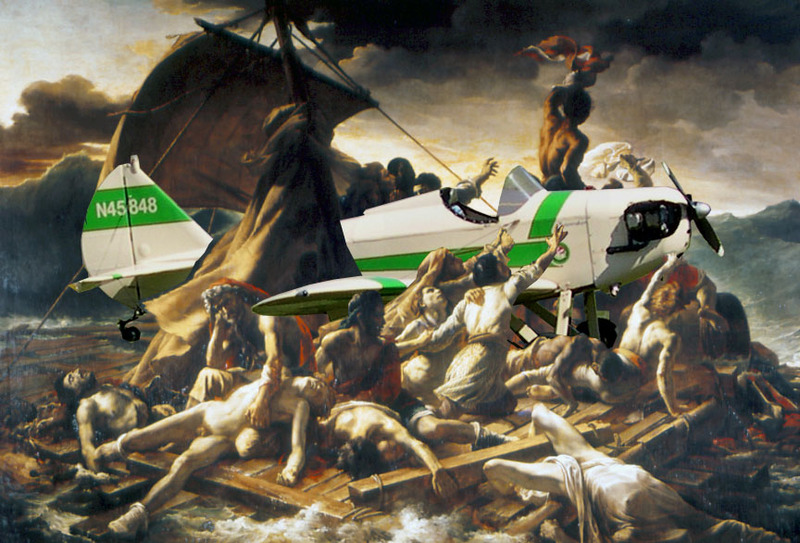 There was no way to land these fighters... the pilots had to ditch, and hope to be picked up before they drowned or froze. Fly Baby builders have a tendency towards military paint jobs. 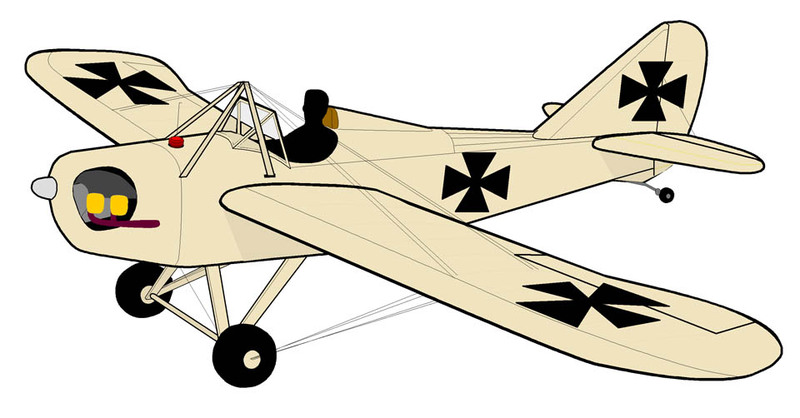 Occasionally, when someone builds a Fly Baby biplane, they even use a German WWI paint scheme. The second was even more interested. 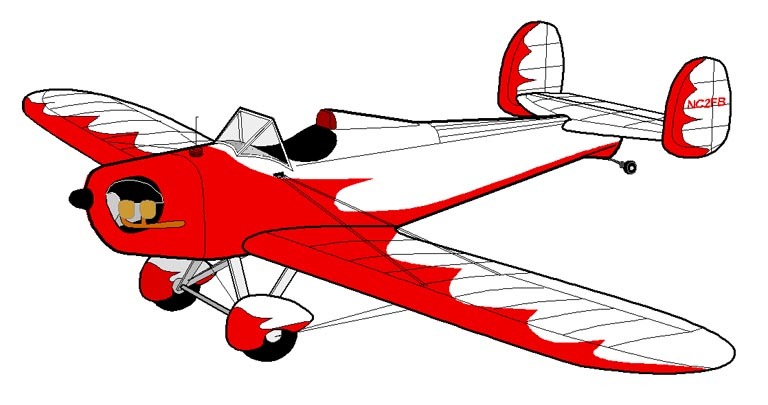 One potential builder wanted to use "faux Junkers" effect on a Fly Baby biplane... to have a two-seat German biplane! Discussion of these German configurations, coupled with the Morane mod discussed earlier, led to some speculation about a replica German "Taube." 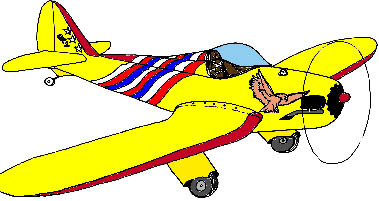 Gee Bee paint schemes have been popular on Fly Babies, but have you ever wondered what one would look like with a small radial engine? A Metal Fly...Ahhh, open-cockpit airplane? OK, we were discussing how one could build a MODERN Fly Baby. Aluminum construction was suggested. Then I got to thinking...why not adapt a current design?